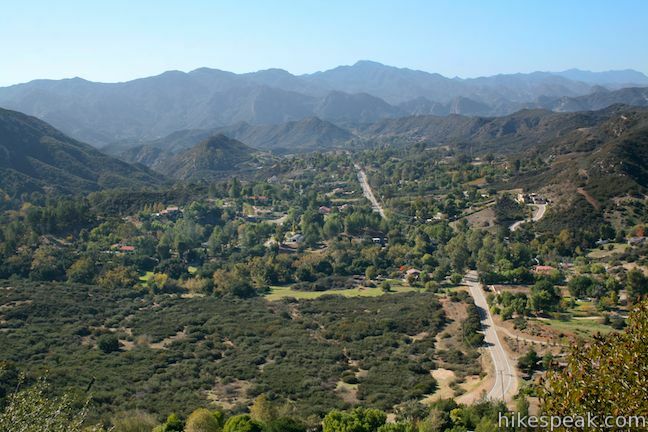 Calabasas Peak offers panoramic views of the Santa Monica Mountains, Red Rock Canyon Park, and a sliver of the Pacific Ocean. 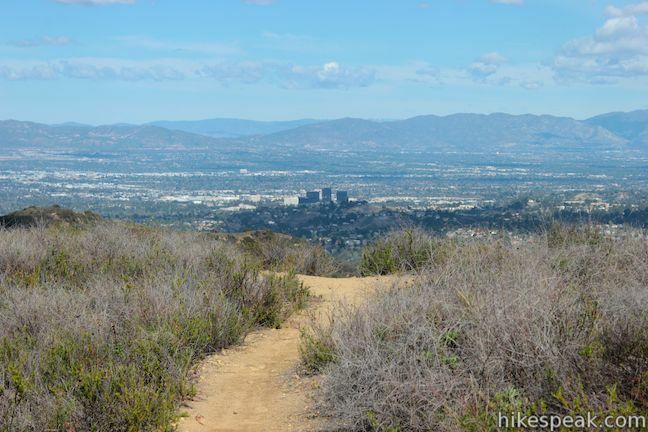 To the north, the peak looks down on the city of Calabasas and a wide stretch of the San Fernando Valley. 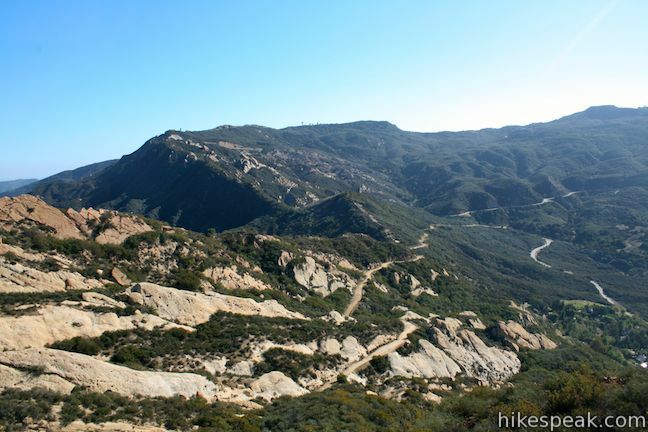 The 3.6-mile round trip hike to Calabasas Peak travels an easy-to-follow fire road. 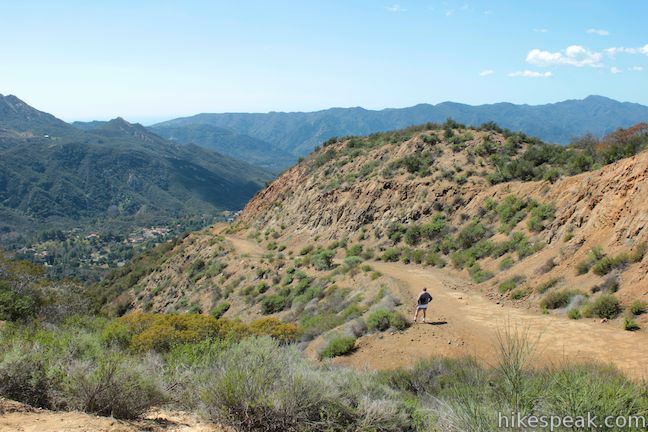 There is 900 feet of elevation gain along the way, but that effort is rewarded by great views at every turn. 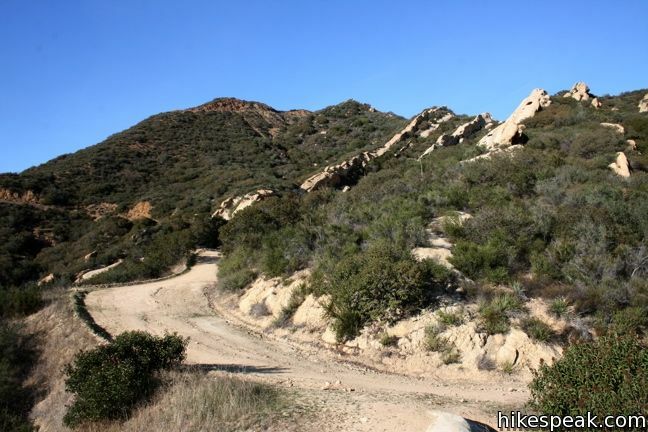 Begin up Calabasas Peak Motorway from Stunt Road. 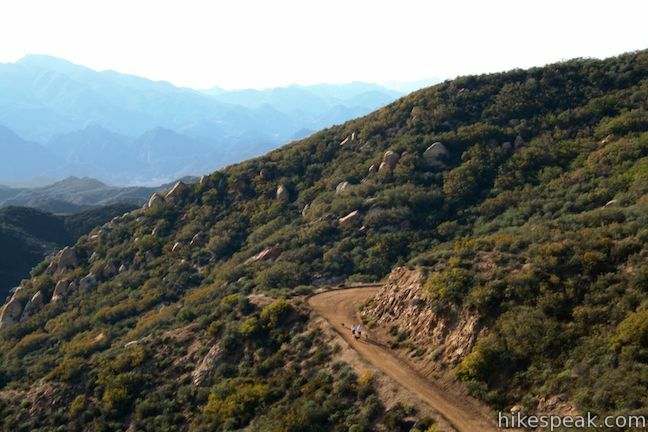 The wide dirt trail rises to an early horseshoe-bend that looks down on Cold Creek Canyon. 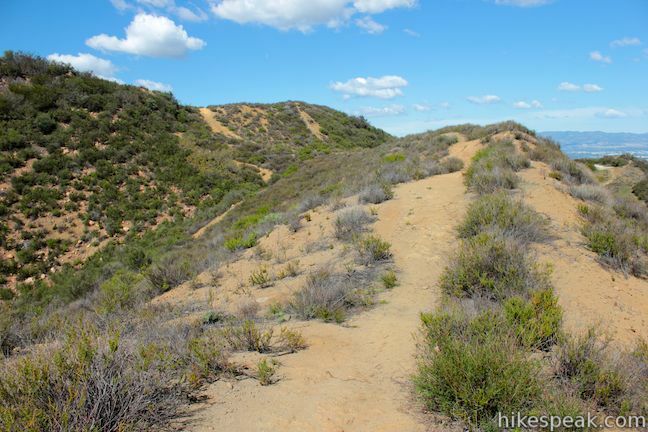 Views of this round valley improve as the trail turns north and levels out. 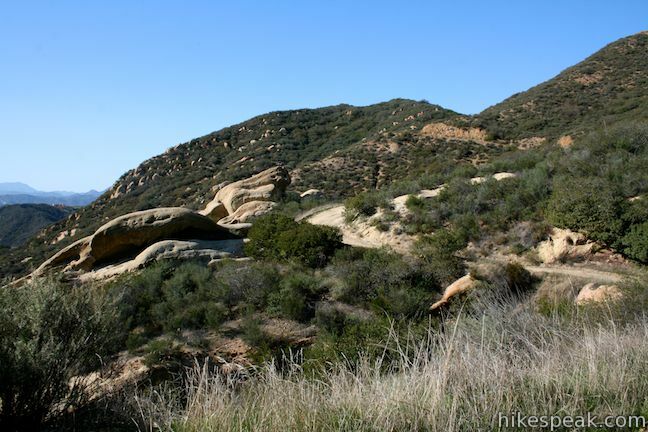 The hike’s big junction comes 0.7 miles from the start. 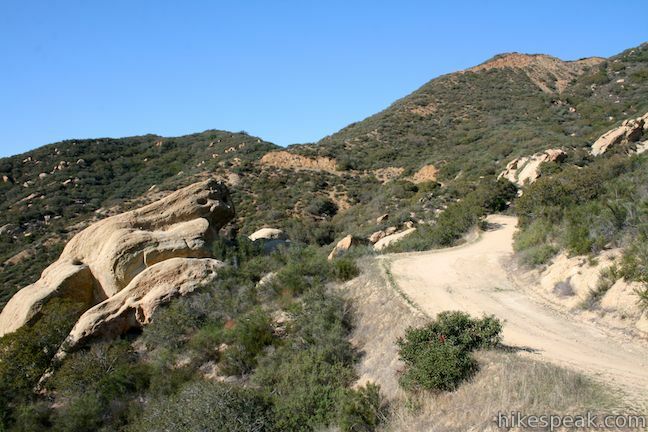 To the right, Red Rock Motorway descends into Red Rock Canyon Park. 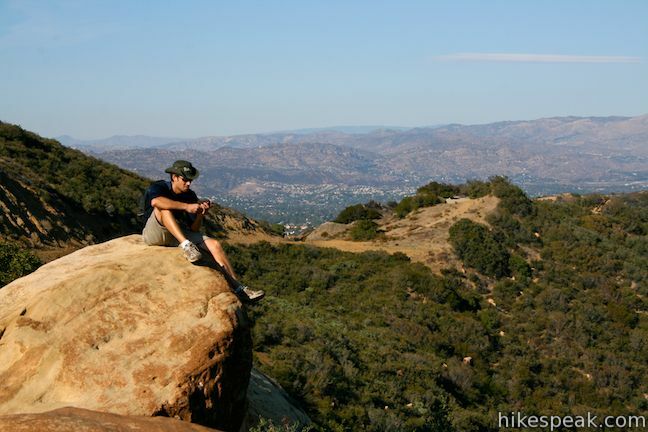 Feel free to have a rest on the bench provided before continuing straight up Calabasas Peak Motorway toward Calabasas Peak. 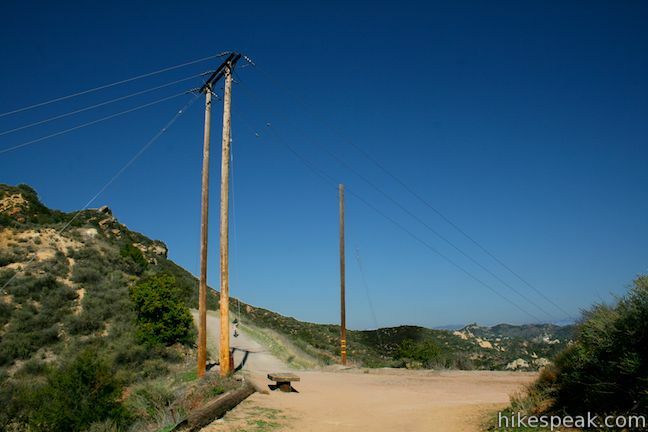 The trail swings to the left before winding back in the other direction. 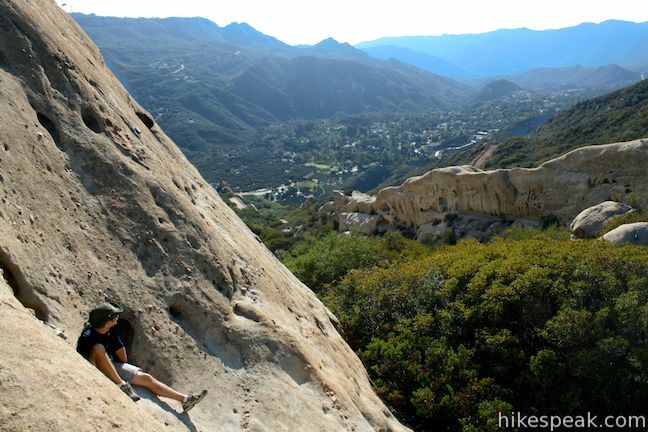 The moderate ascent becomes more earnest, gaining 450 feet in the last mile. 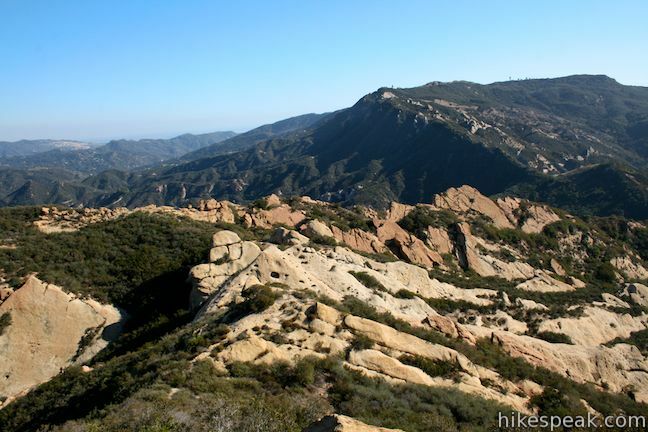 A group of sandstone formations just beneath the true summit offer immense views and make for a natural stopping point. 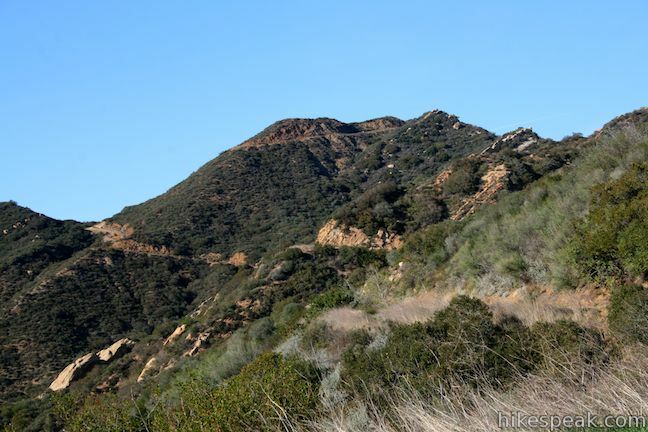 To reach the summit, continue a short distance up Calabasas Peak Motorway and take the path up the ridge on the left to the true summit. 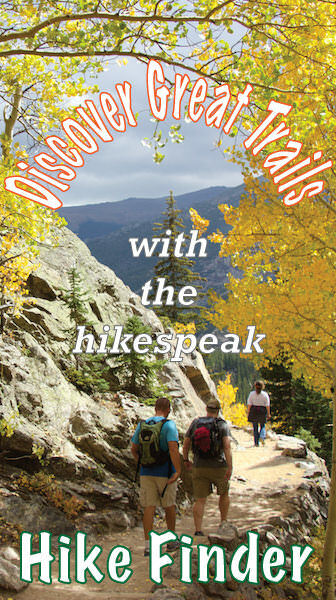 Hike a tenth of a mile up the path to a T-junction. 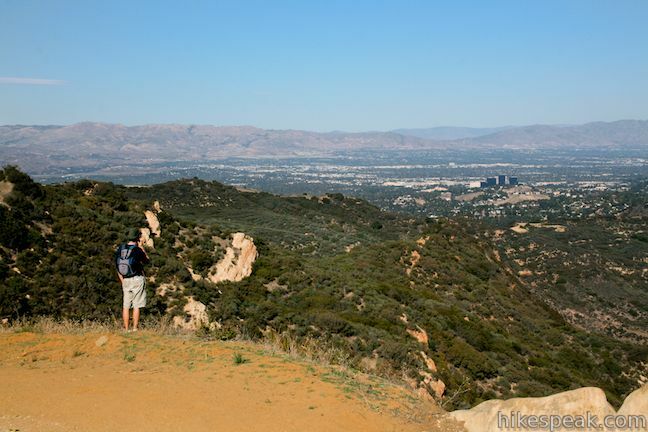 The path to the right takes a steep route down the north slope to Calabasas Peak Motorway. 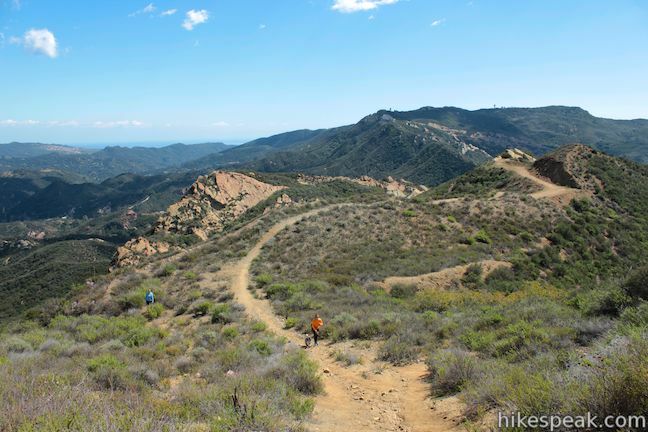 Turn left and hike the last 50 yards to the summit of Calabasas Peak. 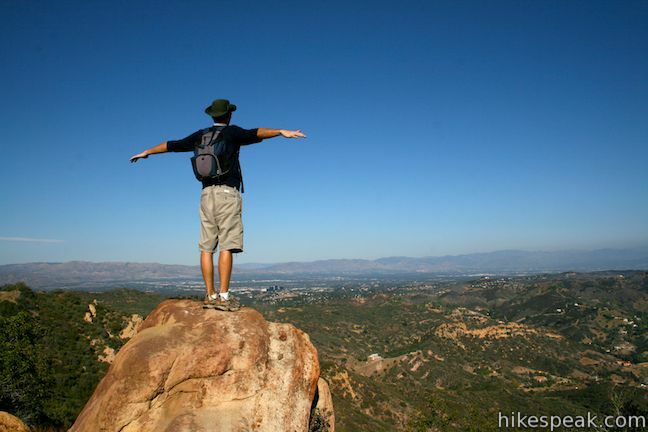 The small summit has a register at the top. Waist-high brush allows for open panoramic views. 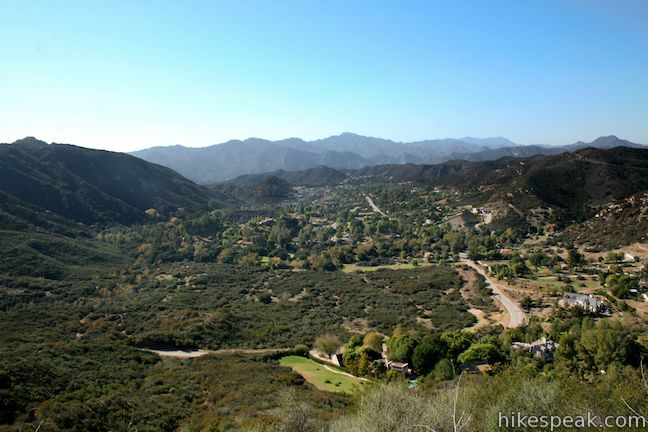 Look east toward Topanga, south toward Saddle Peak, west toward Castro Peak, and north over the San Fernando Valley where downtown Calabasas is marked by a cluster of tall dark buildings. 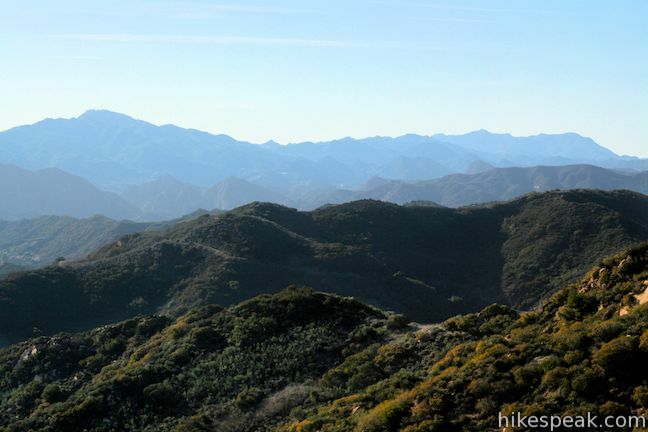 The sometimes-snowcapped San Gabriel Mountains are visible across the valley. 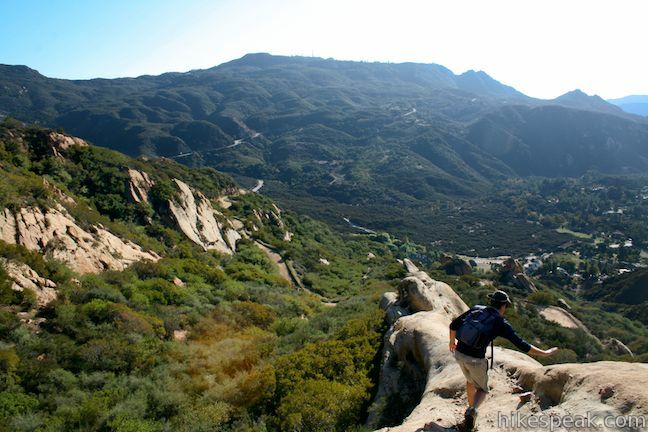 Hike back down the way you came to Calabasas Peak Motorway. 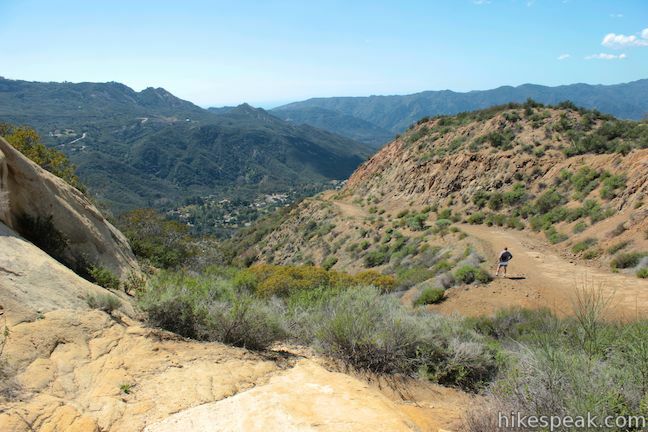 The road continues down a ridge on the north side of Calabasas Peak, reaching Old Topanga Canyon Road after 2.1 miles. 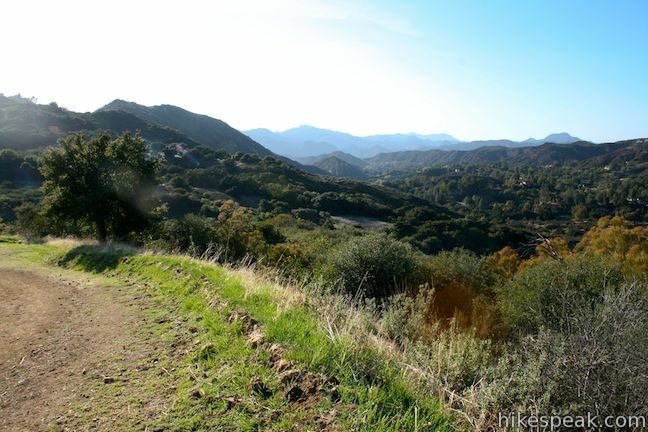 Along the way, the trail passes the top of Calabasas – Cold Creek Trail. 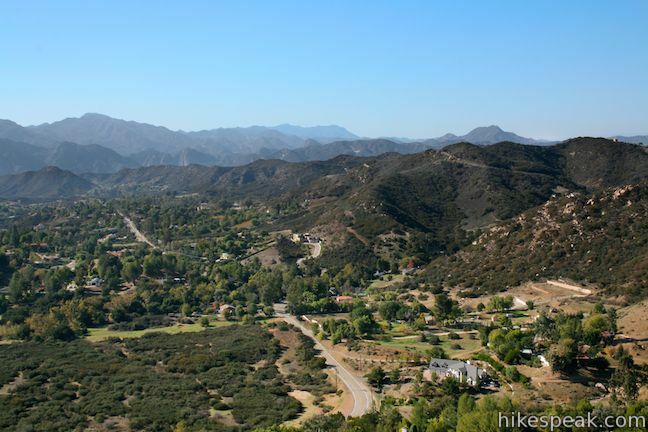 Calabasas – Cold Creek Trail and the north end of Calabasas Peak Motorway offer two other routes up Calabasas Peak. 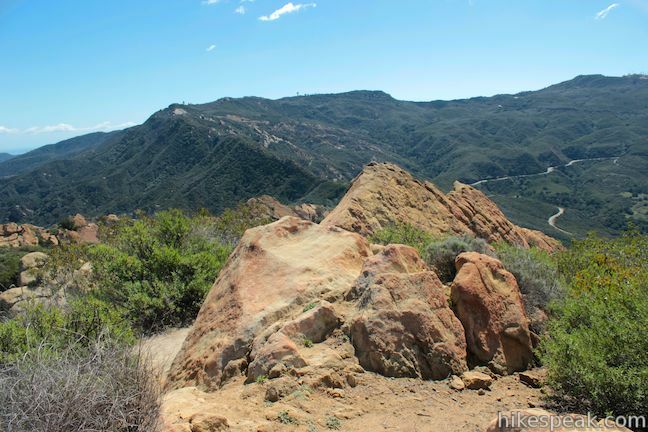 If you started from Stunt Road, simply return the way you came to get back to the trailhead. 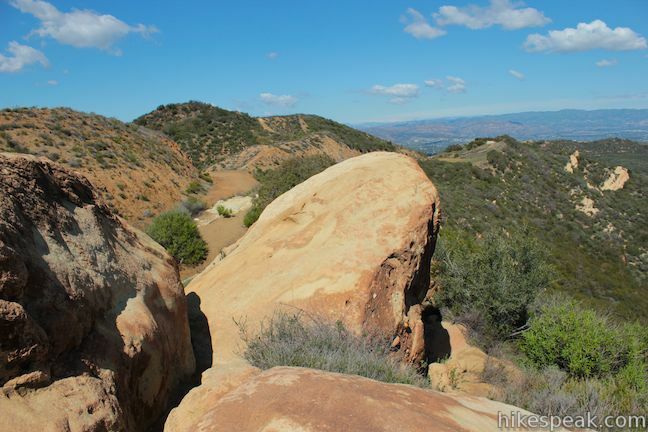 The geology around Calabasas Peak makes this area an ideal candidate for bouldering. 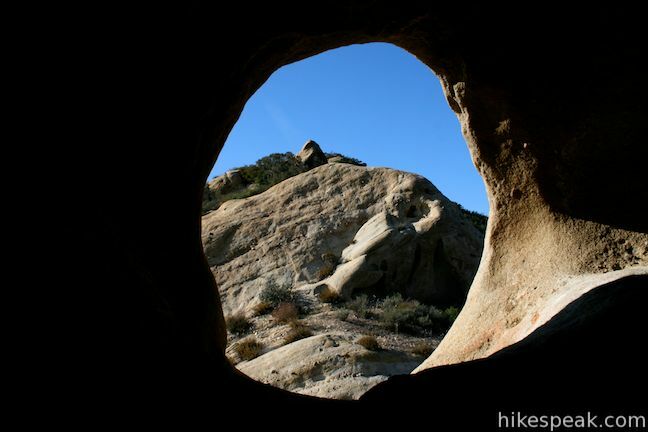 Those up for a bit of off-trail adventure can make their way down the sandstone slabs, carefully exploring the interesting outcroppings, along a more direct path back to the trail below. 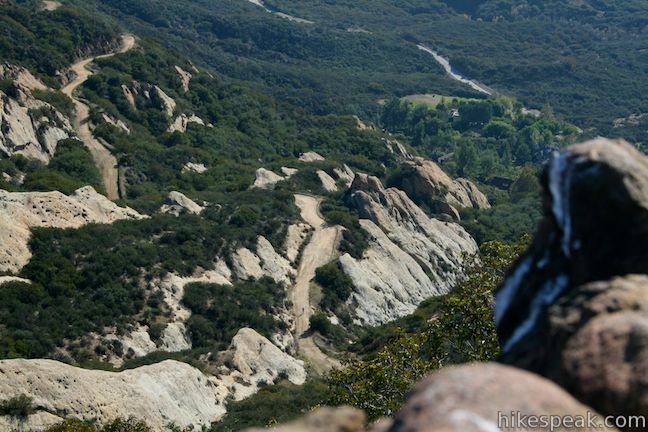 No fee or permit is required to hike Calabasas Peak Motorway. 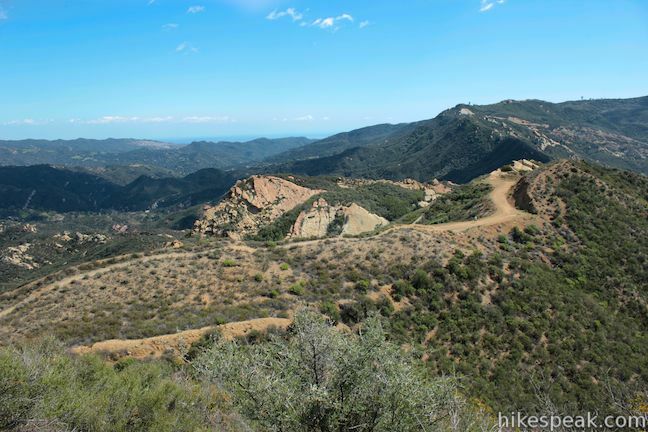 Dogs and mountain bikers are welcome, so get out and enjoy! 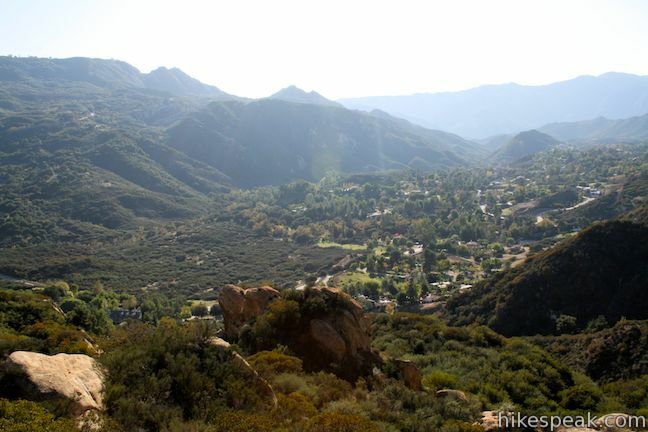 To get to the trailhead: From the 101 freeway, exit Las Virgenes Road and head south toward Malibu. 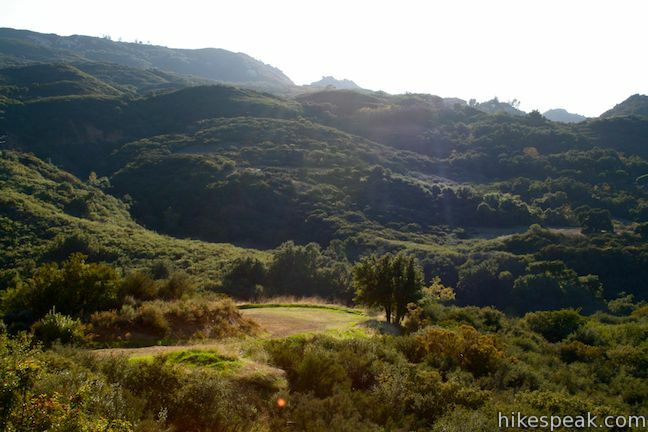 After 2.8 miles turn left, (east) on Mulholland Highway. After 4 miles, turn right on to Stunt Road and drive one mile. 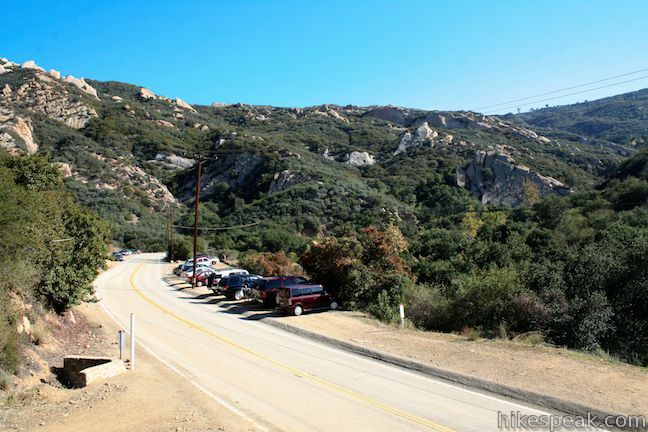 There is plentiful parking along the right side of the road at the trailhead for Stunt High Trail. 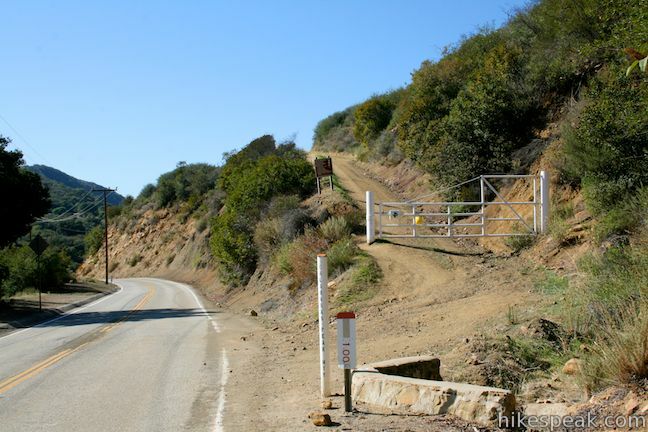 The trail to Calabasas Peak starts up the gated fire road on the opposite side of Stunt Road. 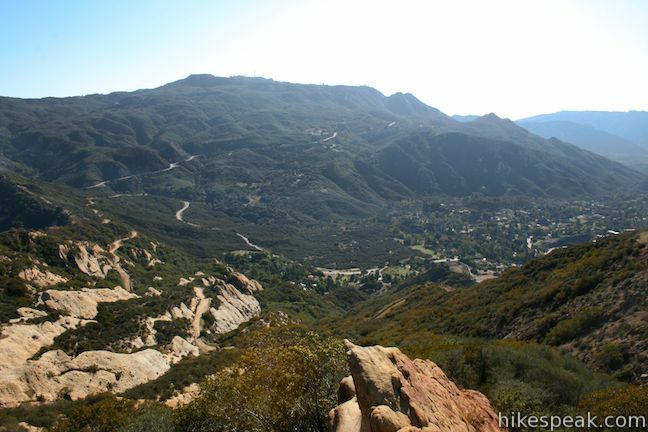 From PCH, take Malibu Canyon Road until it becomes Las Virgenes Road. 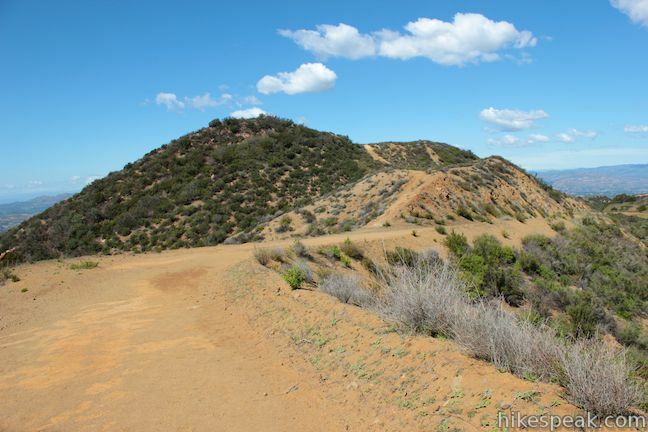 Turn right on to Mulholland Highway and take that to Stunt Road as described above. Another option for those coming from the west side is to take PCH north to Las Flores Road (across from Duke’s restaurant). 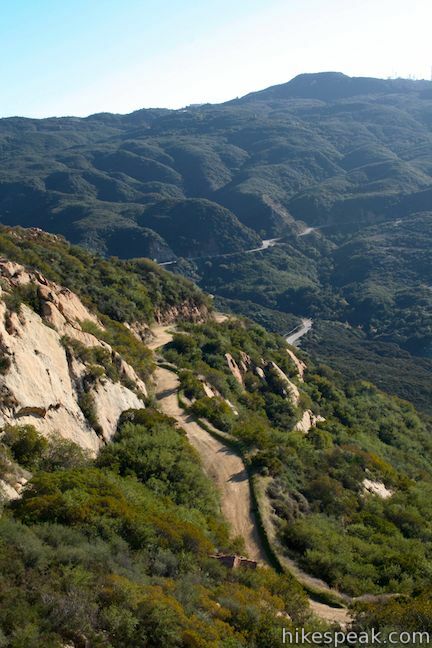 Drive 3.4 miles up this narrow twisting canyon and turn right onto Rambla Pacifico Street. 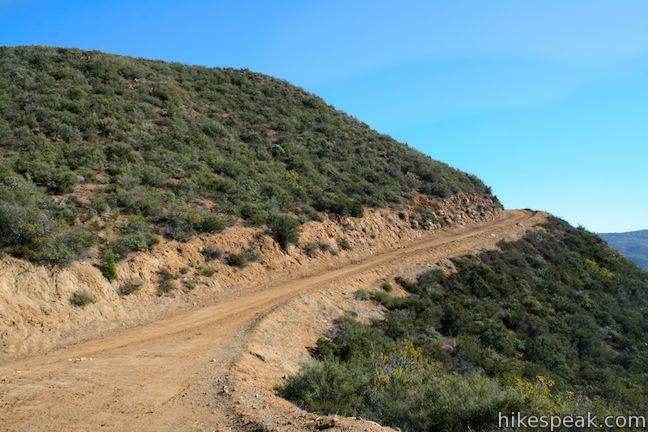 After 0.6 miles, make a sharp right onto Schueren Road and descend the backside of the mountain for 5 miles to arrive at the trailhead for Calabasas Peak from the other direction. 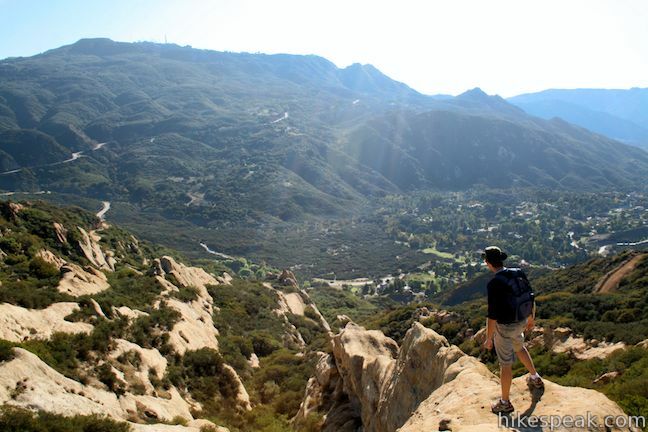 This scenic route offers a high view on Malibu and the Pacific. 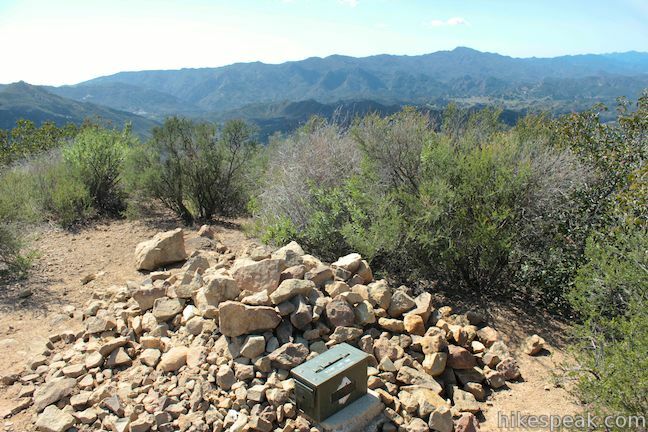 These photos were taken in October of 2009 and March of 2013. Click to enlarge. 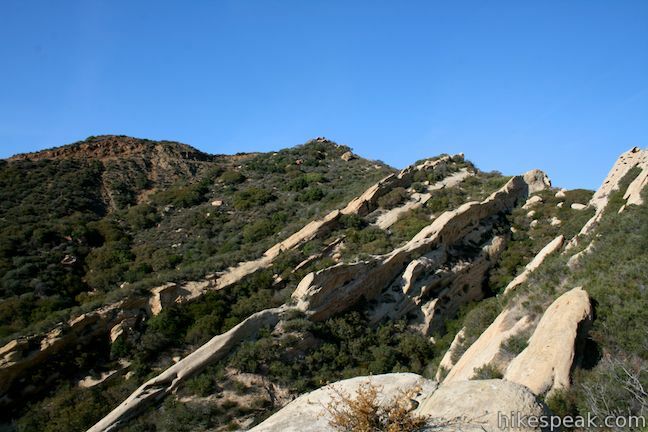 We hiked this yesterday. 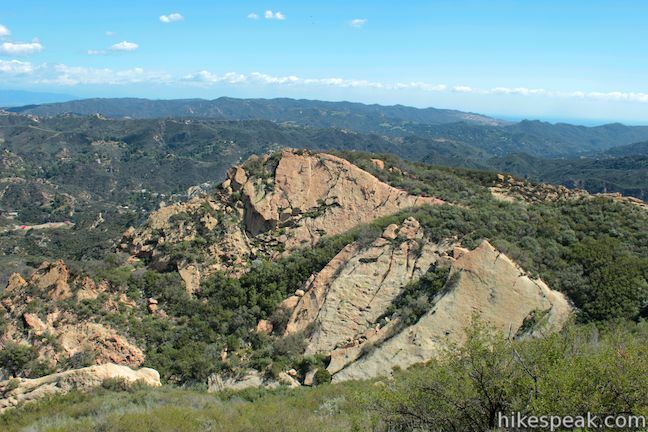 The geology along the route is great and there are some good views. 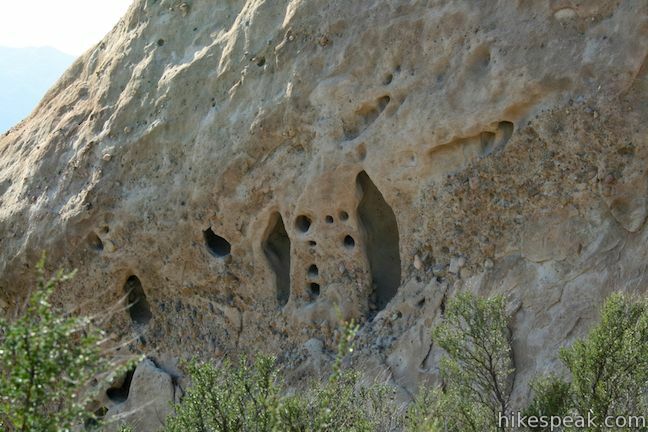 However, it was a crowded trail and very loud. 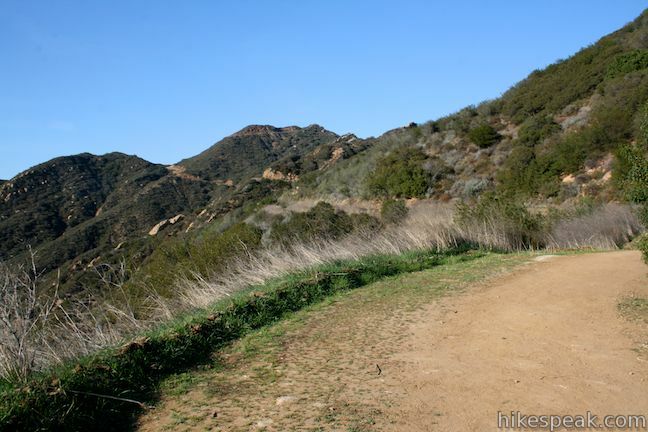 I’ve been on Griffith Park trails that were more peaceful. Barking dogs and yelling kids. Also, you can hear traffic (motorcycles) and power tools/leaf blowers from the houses nearby. 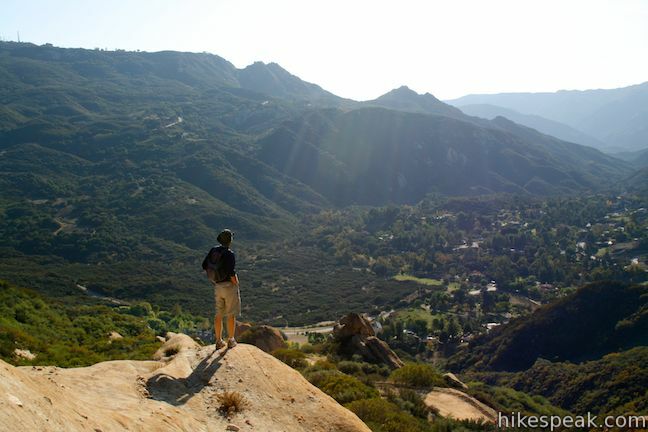 Not a bad hike, just don’t expect your peaceful moment with nature!